The view of the 'passageway' early in the digging process. Now that we had discovered the continuation of pocket MMP28-04, the first order of business was to expand the opening. This required us to blast the floor in front of the pocket lower by a few feet. This blasting, fortunately, did not affect the pocket. Once we had dropped the floor, it was a relatively simple matter to remove some pocket debris in the front. When we did so, we were amazed to see the quantity of crystallization laying on the top of the pocket. 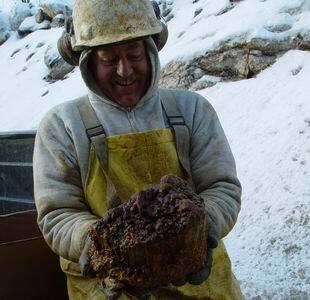 The first piece to come out was a large rusty elbaite. This pocket was indeed more rusty than even MMP11-04 which was a truly messy pocket. Here Frank and Richard pose for me while I 'capture the moment'. We alternately vowed not to use our short handled hoe to dig this amazing pocket as we exchanged it back and forth amongst ourselves to dig with. 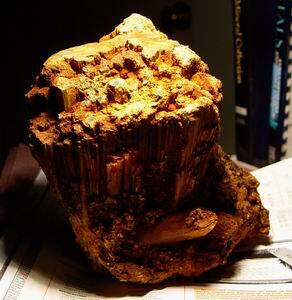 When it came back to me, I noticed what I thought was a rusty feldspar plate on top of the heap. I was sure this spar had shelled off the pocket wall. I hooked an edge and gave it a mighty tug. The feldspar plate flipped out and landed at our feet. Jesus! 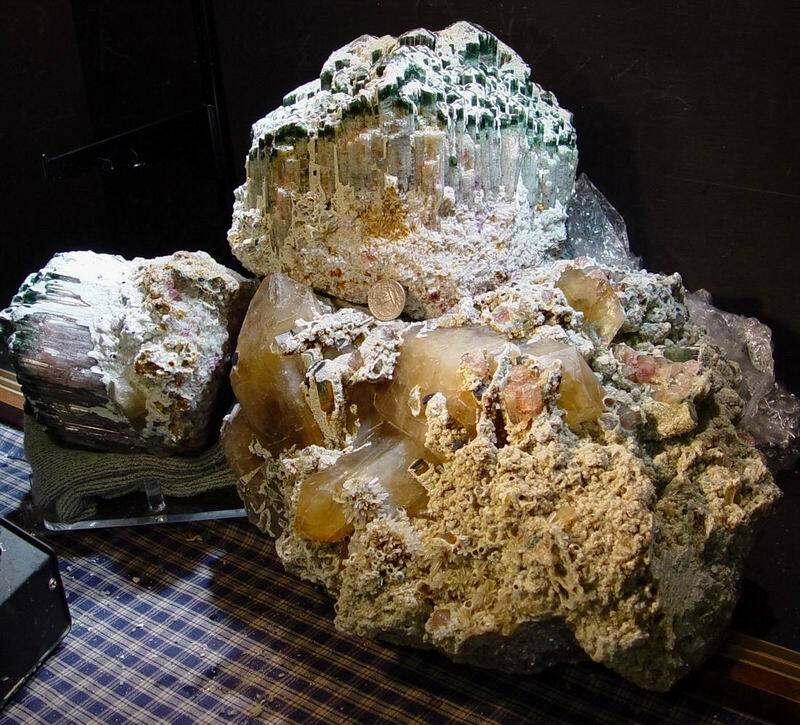 This was a huge terminated elbaite. We couldn't believe it. Each of us took a turn posing with this rusty beauty. 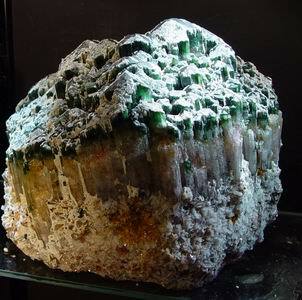 The 'Cake' elbaite after some cleaning. The find was so startling I felt I should go back to the house and email Mary the pictures of this discovery. While I was away, Richard and Frank continued to probe the pocket. Using the now 'verboten' hoe, an implement we would continue to use despite our vows to reform our methods, Frank reached back into the pocket to retrieve something or other. -- Actually, while I'm away running errands , I prefer that digging cease. For me the discovery rush is the most rewarding aspect of mining. It is nice to see what came out but there is nothing that competes with the actual moment of the find.-- Frank successfully snagged his prey and handed the rusty muddy lump to Richard. Richard hosed it off only to be shocked to see that it was another beautiful elbaite. 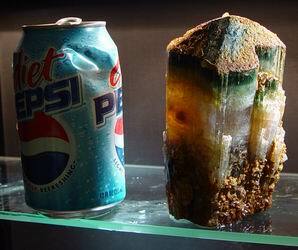 Rather than being a compound cluster like the Cake, this piece, now anointed the 'Pepsi Can', was a essentially single crystal. Frank and Richard decided at this point they should cease digging until I returned. After the mandatory chastisement session ( the beatings will continue until morale improves), we got back to gingerly removing quartz groups from the pocket. As we did so, the mammoth Titanic like plate at the top of the page came clearly into view. The piece had dropped from the ceiling sometime in the long distant past and sank by the bow into the debris. Pieces of elbaite projected from the stern. 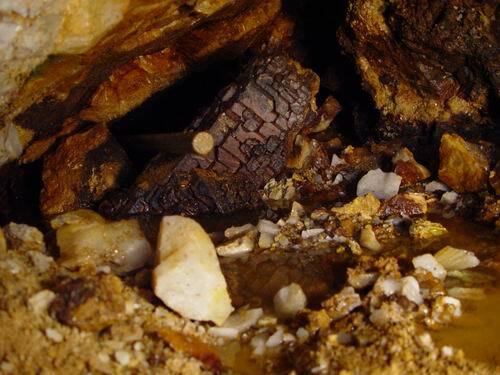 As we worked, we failed to notice the tourmaline stump just to the right of the quartz Titanic ( see top image). Only while carefully examining the images at home did I notice this attachment point. This is the spot from which the Cake at one time projected into the pocket. Whether it hung there for hours or 1000s of millennia is an open question. At any rate, on December 16th of 2004 it was face down in the debris where I unceremoniously extracted it. The oval depression just in front of the quartz plate is the crater left aftre the Cake's extraction. I vowed to go back the next morning and retrieve as much of the attachment as I could. The 'Cake' setting on it's base. On the 17th a little chisel work easily separated the 'Cake's' base from the pocket wall. Unfortunately, it tended to separate into large fragments. 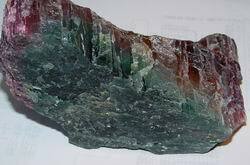 The core of the Cake, like the other large tourmalines from this pocket, is deep red. This red gradually grades to a green , then dark blue. While I went back to the house to put away theses pieces Richard removed a dozen of so quartz groups from the 'Passage Way'. With their removal we could now just squirm into the passageway. This was not a job for claustrophobics. As I wiggled in on my back, I feared a plate would drop from the ceiling and wedge me in place. 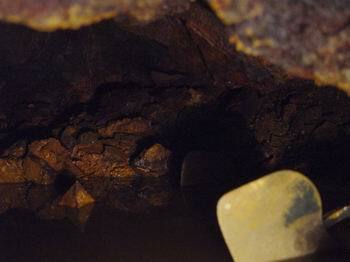 When I did get in, I was amazed to see that the 'Passageway' led to a still larger chamber. Now there were at least three discrete connected cavities to MMP28-04. Laying our forbidden hoe out in the chamber, I was able to balance my camera on the handle and take this dark picture. Our minds were in over-drive as we wondered what would be in this still larger sub chamber of unknown size.